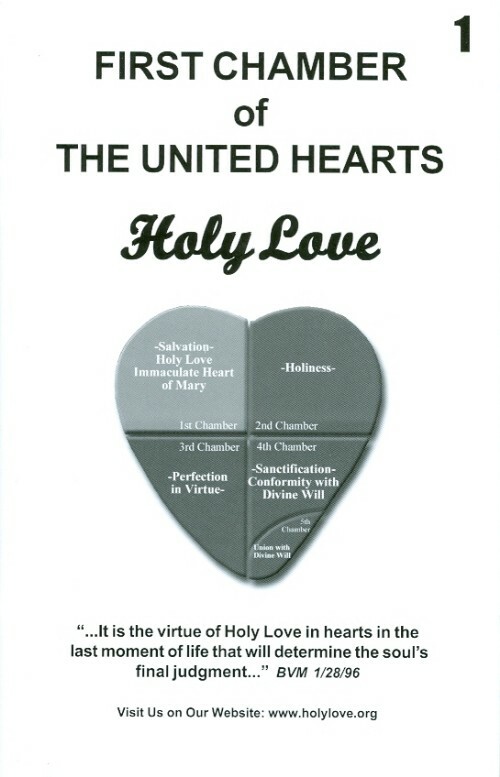 Booklet: First Chamber of The United Hearts: Holy Love. Jesus explains The Soul's Journey into the United Hearts. Highlighted are Messages from Jesus, Blessed Mother, St. Margaret Mary Alacoque, St. Anthony and St. Thomas Aquinas. In this Chamber, glaring faults and sins are revealed to the soul. He chooses either to surrender to Holy Love (conversion) or to continue in error. If he chooses conversion and overcomes his most flagrant faults, he can move into the next Chamber of My Heart and Divine Love. Jesus described Heaven to us when He walked the earth, as a precious gem worth more than any, a gem so precious that we should give up all we own to possess it. That gem, indeed Heaven itself, is Holy Love. Yes, Holy Love is that precious, that important. For without our yes to Holy Love there is no salvation. Front cover measures 5 x 7 in. 19 pages.